This Irish hair clip is perfect if you like to dress up for St. Patrick's Day. 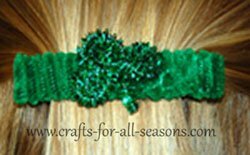 These shamrock hair barrettes are very easy to make. This is an excellent project for an older child. All you need is a hair barrette and some green pipe cleaners! I like to use the solid green for the base and glittery green pipe cleaners for the shamrock. 1. Begin by measuring on the cardstock a rectangle that is slightly longer than the hair barrette. You can make it any thickness as you want. Then cut this out. This will be the base for your hair barrette. 2. Start to wrap the solid green pipe cleaner around the cardstock to completely cover it (see photo). When you get to the end of the pipe cleaner, twist the end of it tightly to a new pipe cleaner and keep wrapping. It took me two pipe cleaners to wrap this barrette. 3. When you are finished rolling, glue the rolled pipecleaner base to the barrette. Let it dry like this upside down. 4. Next, make the pipe cleaner shamrock with the sparkle pipe cleaner. Begin to roll it in a flat spiral, to make one of the three clover leaves of the shamrock. After you have one leaf done (about 3 rotations), bring the pipecleaner across to the other side (as shown below) and begin the next spiral. When that one is done, bring it to the middle to do the next spiral. Don't worry if it looks messy on this side with the overlapping pipe cleaner, because this is the back of the shamrock. When you turn it over it will look great. 4. Glue the pipe cleaner shamrock to the barrette. You can either glue it in the center or off to one side. All done!